When you look at the Red Sox’s 12-13 record to start the season, it’s easy to see that things haven’t been going great for this team. When you take a closer look, you can see that things have been getting worse with each complete cycle through the pitching rotation. There are numerous ways of judging a team’s effectiveness over the course of a season. Obviously, you can look at the results of each game, but the teams that are successful are the teams that win series. Successful teams have starting pitching rotations that win their five-game cycles. The Sox are not currently one of those teams. As you can see, it’s gotten worse. The mediocrity of the starters puts pressure on the bullpen to perform, often too frequently, and the offense to produce, often more than should be expected. When you look at these numbers you will see why teams value aces as opposed to pitchers who ordinarily would be regarded as a No. 3 or No. 4 in the rotation. An ace can be counted on to frequently win, go deep in a game, give the bullpen a rest, give the offense a rest and provide the team with a reassurance as they enter a ballgame. The Sox don’t have one of those pitchers. The only three-game winning streak for the team came at the end of the first tour of the rotation. The team suffered its first three-game losing streak thanks to a three-game sweep at the hands of the Yankees. •	The Sox starters’ 5.66 ERA is the second worst in baseball with only the Blue Jays’ 5.70 worse. It doesn’t matter if the AL East is mediocre. It doesn’t matter that the Sox have scored 5-plus runs in 14 games, because they have a 9-5 record in those games (the Dodgers are 14-0). 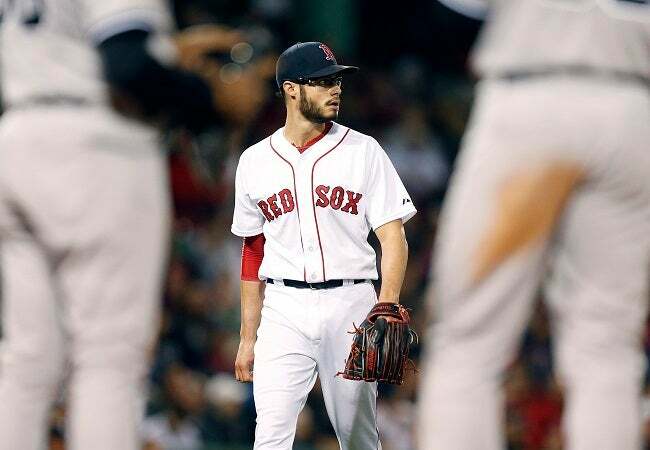 If the Red Sox starting pitching doesn’t start getting better, as opposed to getting worse, this season is going to get ugly faster than John Farrell can call the bullpen.